In the last 7 days Credo staff have been busy out of hours raising money for two different charities that both do wonderful work within our community. 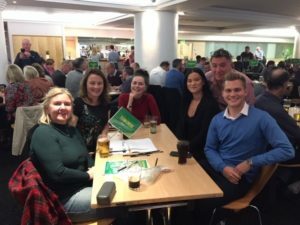 Firstly, on Thursday 6th November 12 staff members took part in the ‘On the Buzzer, City’ quiz night at Carrow Road, helping to raise over £5,800 for the Norwich City’s Community Sports Foundation #buildthenest campaign. Both teams didn’t disappoint on the night and another successful way of raising money for this wonderful project. Then last night, Thursday 15th November, Victoria and Ella from the office took part in the ‘Sleepout 2018‘ at Carrow Road organised by The Benjamin Foundation. This amazing charity states “We want to end youth homelessness and we are tackling the problem locally by providing a home and support to over 100 vulnerable young adults each night. 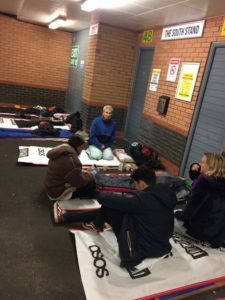 We give the young people stability and support their education, training and careers and ensure they have life skills such as shopping, cooking and being able to budget their money so they can leave us to forge an independent life.” By taking part in the Sleepout last night, Tori and Ella recognise that ‘Sleep Out’ is not the same as the real hardship faced by rough sleepers but it does give those participating the opportunity to see for themselves what it might feel like to be homeless. If you would still like to donate money to either cause then please click on the relevant links below.